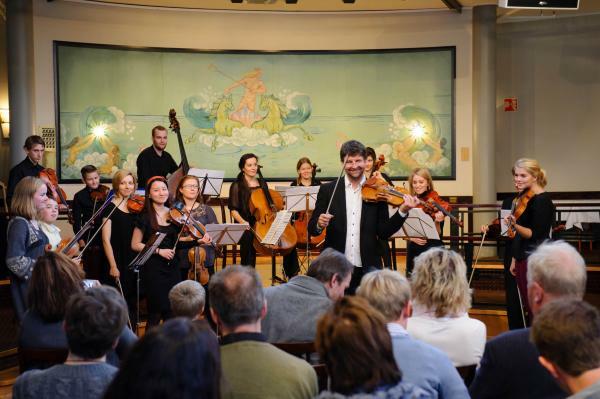 1B1’s vision is to become a new powerhouse for music in Norway, to increase the size of the classical music audience, and to be an example to follow by enhancing the learning environment for music in our region as well as creating an ambitious and independent ensemble at an international level. An overall goal is to demonstrate that it is possible to create activities within our artistic field that can exist freely: musical initiatives that mean so much to so many people that no-one disputes their value. 1B1 is an ensemble that exudes youth, quality and enthusiasm. Rooted in the tradition of classical music and youthful energy, often in collaboration with soloists of the highest quality, the ensemble explores all kinds of musical genres. In the long term, we will also capitalize on the acquired skills to create a broad economic platform where earnings are traded in experiences and expertise, and expertise generates new earnings. If we succeed in this effort, we hope that other ensembles will follow our example and create something similar: projects with the same opportunities for audience building and increased interest in classical music.